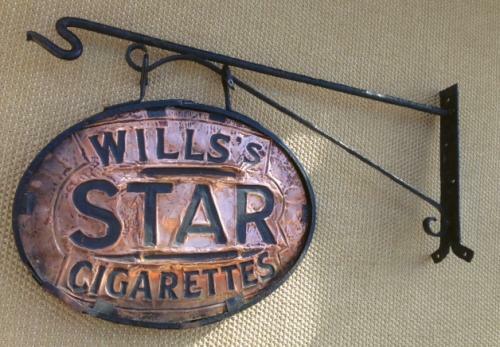 Genuine Wills Cigarettes shop sign on original bracket. The sign itseld is in pressed copper with blackened letters highlighting the words. The sign is double sided. We have had to replace the piece of board that was sandwiched between the two sides of copper as this had disintegrated. The oval surround has also had various repairs over the years too. This is a very unusual sign and probably dates to around 1900. It would look great hung from any wall in a house or shop.